Today we celebrate the 40th anniversary of the Adirondack (New York-Albany-Montreal), which for much of its 381 mile journey follows the broad Hudson River and Lake Champlain’s meandering western shore. Skirting the river’s edge, the train offers pretty views of hilltop homes and boaters out on the water. Further north, particularly along Willsboro Bay south of the Port Kent station, the rails hug rugged cliff sides that drop precipitously down to the lake’s surface. The Adirondack made its inaugural run on August 5, 1974; revenue service began the next day. 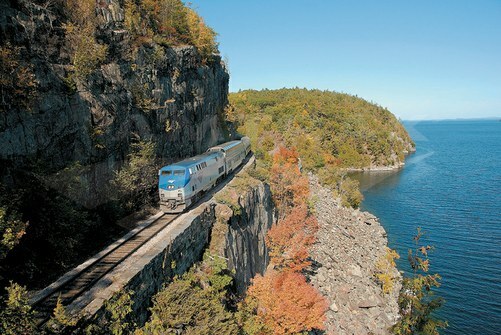 In determining a route between New York City and Montreal, Amtrak had two choices: one through the Connecticut River Valley and up the eastern side of Lake Champlain via Vermont, or one up the Hudson River and the western side of the lake through New York. State leaders and advocacy groups in Vermont mounted an effective campaign to revive rail service, and Amtrak launched the overnight Montrealer/Washingtonian (Washington-New York-Montreal) in late September 1972. Amtrak chose the longer Vermont route because it passed through the state’s popular skiing region, thereby opening up possibilities to attract sports enthusiasts to the service. Against this background, the state of New York decided to take advantage of Section 403(b) of the Rail Passenger Service Act of 1970—the legislation that established Amtrak. It allowed states to work with Amtrak to institute new services if they agreed to reimburse the company for at least two-thirds of any associated losses. One of the state’s proposed routes was between New York City and Montreal, which prior to the start of Amtrak operations had been served by two Delaware and Hudson Railway (D&H) trains: the daytime Laurentian and the overnight Montreal Limited. Interestingly, at a time when Amtrak was repainting the cars it had purchased from the predecessor railroads in its own patriotic red, white and blue livery, the equipment from the D&H retained the company’s blue and yellow scheme and lettering as part of the agreement with the state and Amtrak.6 Of particular note were the PA diesel locomotives that the D&H designated for the service. Constructed by the American Locomotive Company (ALCO) and General Electric at mid-century, they exhibit a long nose and sleek lines that make them a favorite among rail fans even today. Four units were rebuilt for the Adirondack to include 2400-horsepower engines.7 Baggage, diner-lounge and coach cars formerly used on the Laurentian were chosen to round out the rolling stock. Amtrak converted the Adirondack to RTL Turboliners in early 1977. While the passenger cars were sent for refurbishment, stand-ins included older heavyweight coaches and commuter coaches leased from the Metropolitan Transportation Authority.8 The D&H also leased two Skyline buffet lounge-dome cars from the Canadian Pacific Railway (CP). They included a kitchen, dining section with booth seating for 17, coach seating for 26 downstairs and seats for 24 in the dome.9 These cars provided dining space until the D&H diner-lounges Adirondack Lodge and Saratoga Inn were ready for service. Not long after the Skyline domes went back to CP, Amtrak added its own dome cars to the train at the state’s suggestion. Turboclub featured spacious one-by-two seating. The Adirondack entered regular revenue service the next day; according to the first timetable, a one-way coach ticket between New York’s Grand Central Terminal and Montreal’s Windsor Station cost $22.25. In April, 1975, the Adirondack became an independent train for its entire New York-Montreal run—the coaches were no longer carried by Empire Service trains between New York City and Albany-Rensselaer. Two years later, on March 1, 1977, Amtrak converted the Adirondack to RTL Turboliner equipment, thereby ending the use of the D&H cars and locomotives. The new trainsets were based on the earlier RTG Turboliners, which were in turn developed from a French design. 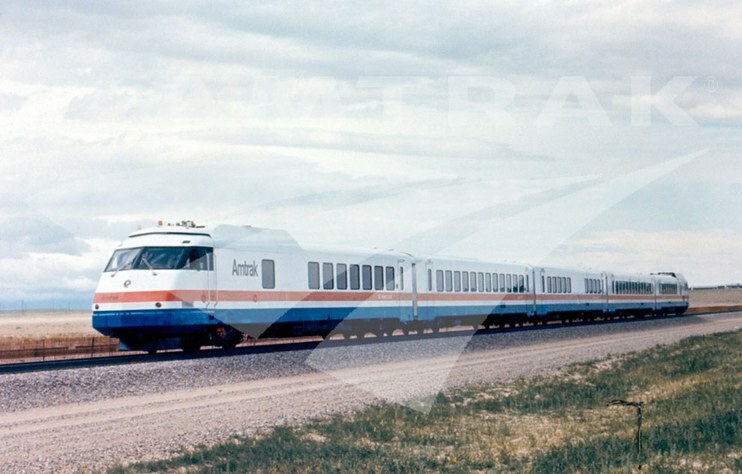 Built by Rohr Industries, seven RTL Turboliner trainsets were delivered to Amtrak in 1976-77 for use in upstate New York. They were modified from the RTG units to include American couplers and standard 480 volt head-end power. To access Grand Central Terminal, the RTLs were also equipped for third rail electric operation. 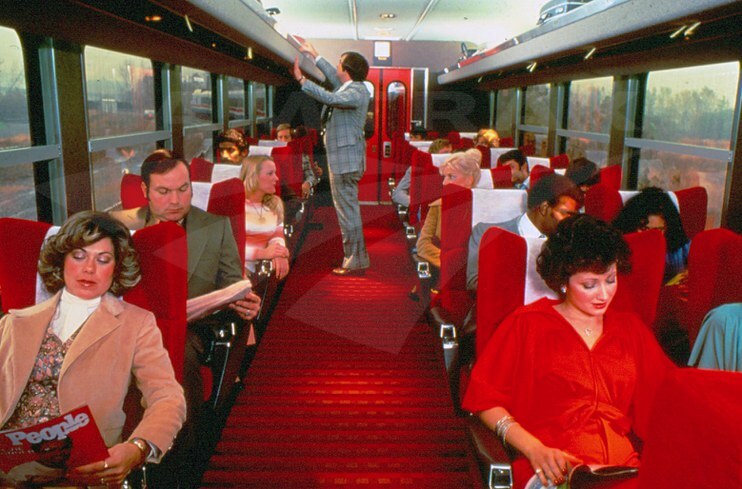 Promotional material noted that the new trains offered “a smooth, quiet ride in an air-conditioned, entirely carpeted interior (walls and ceilings as well as floors)" and large, wide windows from which to admire the scenery. Passengers could choose between coach or Turboclub, a reserved club car service featuring spacious two-by-one seating and assistance by an attendant. The Adirondack currently uses a mix of Amfleet I and Amfleet II coaches. A P-32 locomotive leads the train between New York City and Albany-Rensselaer since it is capable of operating over an electric third rail into Penn Station (all Amtrak trains serving Grand Central Terminal switched over to this facility with the completion of the Empire Connection in 1991). The Adirondack has always been popular with those in search of colorful fall foliage. In recent years, the train has included a special, historic piece of equipment during this period: the Great Dome car. Open to all passengers, it features upper level seating beneath the dome for all-around panoramic views. Built by the Budd Company in 1955 for the Great Northern Railway, the dome car was originally used on the Empire Builder (Chicago-Seattle). Amtrak obtained the car in 1971, and it was later used in regular service on the Auto Train (Lorton, Va.-Sanford, Fla.). Although the Great Dome is today used on various trains and in charter services, it often appears on the Adirondack or Cardinal (New York-Chicago) in the autumn. The Adirondack skirts rocky outcroppings along Lake Champlain. On weekends from May through October, passengers aboard the Adirondack can learn about cultural, historical and natural landmarks along the route through the Trails & Rails program, a joint initiative of Amtrak and the National Park Service. Volunteers based out of the Vanderbilt Mansion and the Home of Franklin D. Roosevelt national historic sites ride the train between Croton-Harmon and Albany-Rensselaer, while their counterparts from the Erie Canalway National Heritage Area are available between Saratoga Springs and Westport. Four decades after the inauguration of the Adirondack, New York State continues to financially support intercity passenger rail service as part of a statewide multimodal transportation system. New York State, Amtrak and the federal government are currently working together to undertake numerous projects that will enhance the rail network. These include the addition of a much-needed fourth track at the Albany-Rensselaer station, signal line improvements south of Albany, the construction of an additional track between Rensselaer and Schenectady, and grade crossing improvements along the southern portion of the Empire Corridor. When completed, these infrastructure improvements will positively affect the on-time performance and reliability of the Adirondack and Empire Service trains. Check out memorabilia from other Amtrak inaugural trains! 1 National Railroad Passenger Corporation, 1972 Annual Report, (Washington, D.C., 1972). 2 Karl R. Zimmermann, A Decade of D&H, (Oradell, N.J.: Delford Press, 1978). 3 Doug Lezette, Delaware & Hudson Passenger Trains: The Final Decade, (Goffstown, N.H.: Railroad Explorer, 2002). 11 Edward C. Burks, “New York-Albany-Montreal Train Is Resumed With a Festive Air,” The New York Times, August 6, 1974.